How Does the Addmen Question Paper Generator Software Work? Addmen OMR software comes as three separate modules OMR answer sheet checker software, OMR form reader software and question paper generator software. While the test paper generator software is not based on the OMR technology, it is a useful tool for examination process; it makes generating question papers an easy task. This software comprises of two parts; the first is a question bank software which helps managing the question bank and the second is the test generation software which helps to create different types of test papers. The process of operating the question answer software can be explained in four simple steps. Let us take a look at them in detail. Step 1 - How to prepare Questions and Answers content in Question Bank ? The first thing that one has to do is enter questions in Word files. Yes, you do not need to buy the software at this point. Even before you buy the software, you can create the questions in Word files. Make sure that you create them systematically. The Word files can create any number or types of questions MCQs, true or false, diagram making, fill in the blank, common passage and numerical. Moreover, you can enter questions for theory papers as well. And the questions can also be of many languages. Step 2 - How to classify the Questions in Question Bank Software ? The second step is where you create the question bank and allocate properties to the questions. The question Word files are saved as QR files in the software. You can manage the question bank through the software interface. At this stage, you have to provide properties to the questions like which Unit (subject) it belongs to, the chapter, topic, category, level of difficulty as well as type of questions (theory, numerical, one correct, fill in the blank, etc.). Step 3 - How to define the requirement of a question paper as per the exam pattern ? The third step where the user creates the actual question paper. This is done through the blueprint interface. At this stage you define the type of paper you want like the number of questions, the unit or subject, chapter, category, level of difficulty, type, etc. For instance, if you want 20 questions in total for creating Chemistry paper, you can select 4 questions from one chapter in the easy level and 6 questions of the same chapter in the very difficult level and so on. 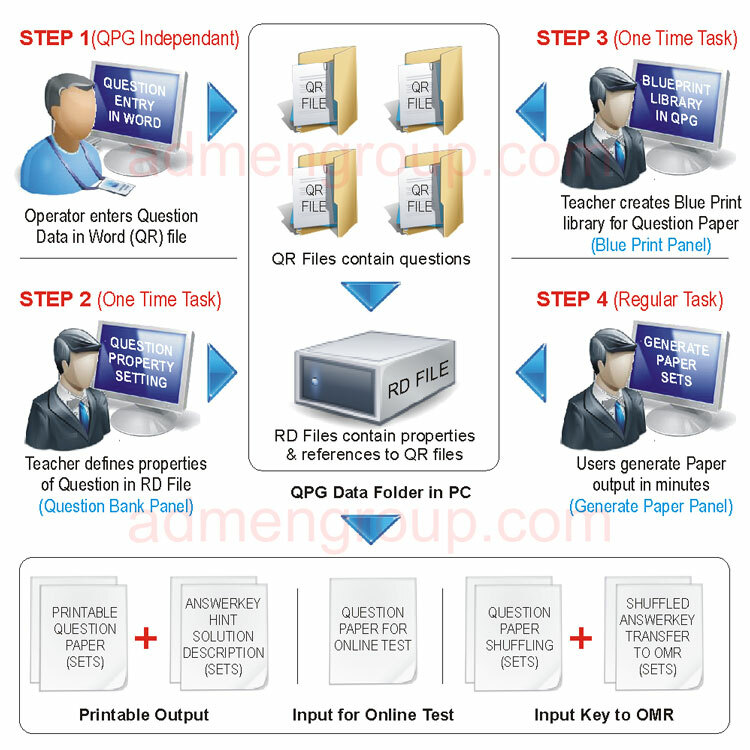 Step 4 - How to generate Question Paper using question paper generator software ? Once you have defined the blueprint of your question paper, the software chooses the questions from the question bank randomly and creates the question paper. You can choose to create different sets of the same question paper to avoid cheating. The test generating software automatically shuffles the questions and generates different types of papers, which are transferred into a desired output format within minutes. Addmen's question and answer software makes generating question papers an easy task. The question bank stores as many questions as you want, and you can add more in the future. Also, there are no chances of errors occurring while creating question papers manually. The test paper generator software makes sure that there are no duplicate questions in the same paper.